In all honesty, it sounds like a thread to whine about how the cheapest header on the market didn't live up to the buyer's expectations, which may have been a bit unrealistic. I mean, OBX headers are what, $100 more? 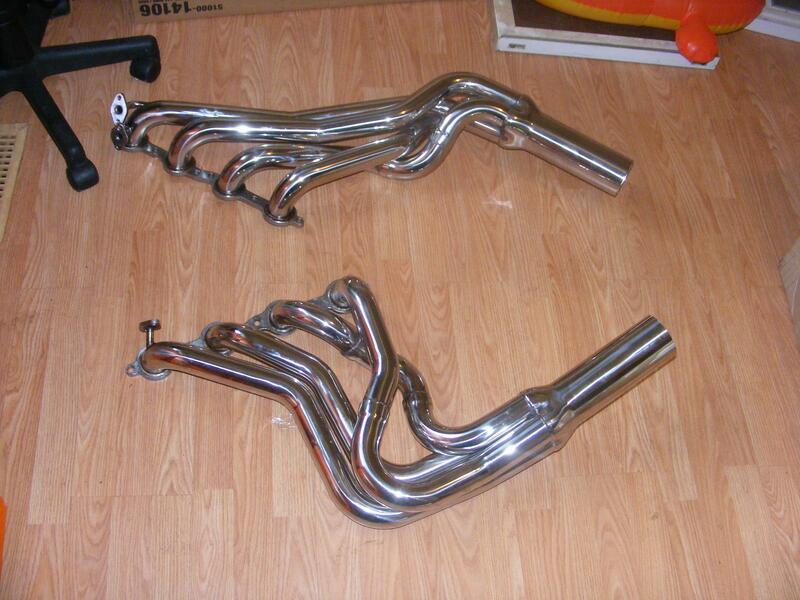 Seriously, if you can' afford $300 headers, then you shouldn't be too upset that the $180 aren't as good. Is there anywhere at all where I complained about the quality of the headers? No, absolutely not. There is nothing at all wrong with the quality. To be honest, I found it to be better than I was expecting. Really, if I was so concerned about cost, don't you think I'd be making a huge stink about the $60 I paid to ship them back? This thread is only about the primary size which is not as advertised. $180 or $580 -- if one purchases something they should receive what they are expecting. Everyone has been expecting (assuming?) they were receiving 1-3/4" primaries for $180, when in fact they're receiving 1-5/8" primaries. Price, performance, etc... argue all one wants, but at the end of the day, this thread was started to provide objective, technical information about the size of the primaries. With that said, would you mind measuring your OBX's and giving us some numbers? Is there anywhere at all that I mentioned quality? No. I said expectations. You expected 304 stainless headers with 1-3/4" primaries for under $200. As long as your expectations are realistic. At $200 for a pair of headers with gaskets and hardware, I'd just be happy that they fit and actually flowed the exhaust gas through them! Please keep this thread limited to technical data and/or relevant personal experience. Thank you to all that have provided information. We aren't here to judge, we are here to trade information and learn. That being said, KnowItAll, you could really help us out as stated before by taking some measurements of your headers. OBX are also price competitive headers, but if they turn out to be slightly smaller than advertised as well it would actually be foolish to spend an additional one hundred dollars on them. You're right, I did expect that -- because that was what is advertised and what everyone has professed since these have become so popular. I'm just the only person who has measured and posted about them being 1-5/8" 15g. I gave them a shot and it didn't work out. No big deal, but I'm certainly going to provide the information for anyone else interested in them. So, how about the measurements for your OBX headers? You're right, I did expect that -- because that was what is advertised and what everyone has professed since these have become so popular. I'm just the only person who has measured and posted about them being 1-5/8" 14g. ****, I'll send you a caliper if you need one! And judging from that pic it does not look like they flared the tubing as in pics of other ebay's. Last edited by AnotherWs6; 06-11-2013 at 12:52 PM. demonspeed, I don't get off the rig until the 18th, but when I'm home this time I'll grab a caliper shot of my TSP 1 7/8"s and post em up on here. Nothing wrong with that. I actually wanted one of those before settling on the Kobalt digital one I bought. I normally use the regular spring divider calipers for OD and ID with a metal ruler. I'll grab the ID as well and put all this to rest as far as TSP goes. They advertise 1-3/4" inlet, do they not? You just assumed they meant the primaries were 1-3/4"? Just like you assume I have OBX headers. Why? Because I mentioned them? Because I posted a picture of them? I actually do not have OBX headers. Strike two. You just assume way too much. If you have nothing to contribute, other than playing imaginary baseball, kindly see your way out of this thread. Fair enough. However, I'm not sure what you're trying to prove. Splitting hairs is all it is when they're advertising 1.75" inlet rather than primaries. At the end of the day, this "community" has presumed that they are purchasing stainless headers with 1-3/4" primaries for less than $200 on eBay. I am providing empirical evidence to the contrary - the quantification can not be disputed. That you just signed up and began posting like you have been leads me to believe your sole purpose is to be an antagonist when one is not needed for the context of this thread. I'm not slamming the eBay headers, the companies, or anything about them other than informing a populous that was not aware of the true measurement. They also have the bungs on the correct side. Last edited by demonspeed; 06-11-2013 at 02:09 PM. What a fng douche. No other word to describe it. You mention OBX, then post a pic of their headers and since you dont own them you actually have zero idea how big they truly are. They could be chrome plated garden hose super glued to a header flange...... you wouldnt know. But please do feel free to come in here and judge people in a thread aimed at gathering knowledge. Thank you for enriching my life so much. And please know that we are all here waiting, quivering in anticipation just dying for your next knowledge packed post. No knowledge, no relevant info, but an avid poster!!!!! Cool. And ds98formula, yeah - if you could that would be cool. Thanks. Last edited by AnotherWs6; 06-11-2013 at 02:46 PM. Who is "Know It All"? Join date says today and he wasted no time getting on people's nerves. Is this 01ssreda4?